Remember Pandora, the Internet Radio service that went viral shortly after its release thanks to its interesting music suggestion service and the fact that it was available to users from all over the world? Pandora shortly thereafter went US-only blocking access for users who tried to connect from other countries. It is still possible to listen to Pandora if you are not in the US, but you need a web proxy or virtual private network for this. One of the things that I never liked that much was that Pandora was only accessible on the official website. This meant that you had to keep the browser window open all the time if you wanted to listen to music from the service (mobile clients are now available). 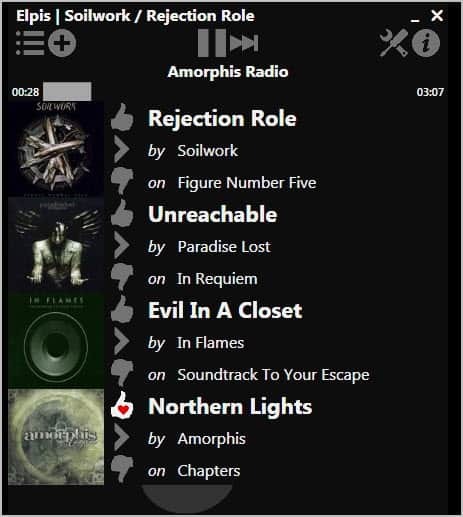 Elpis is an Open Source Pandora client for Windows that changes this. It basically moves all important options that the Pandora web player offers to the client. A free or subscription based Pandora account is however required to start playing music with Elpis. New users can create Pandora accounts right from within the program interface. Once you have linked your account you can start searching for music to play it in the client. Results are then displayed in a list that you can click on to tune into that radio station. Music is from that moment on played automatically. You can now minimize the Pandora player to just listen to music, or use the player controls to vote for songs or pause and skip songs. Global Media hotkeys can be enabled in the program interface. That's useful if you want to minimize the program window, as it allows you to control the player when it is minimized. Elpis will log in to Pandora automatically when the program is started. You can configure the program to start playing the last played station automatically. Individual songs can be bookmarked and favorited with a click on the > icon in the program window. 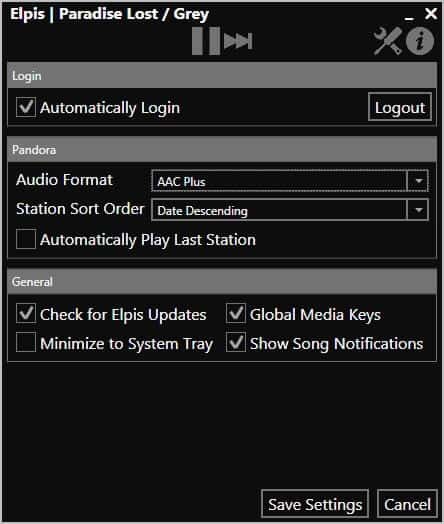 Elpis is an easy to use yet feature rich Pandora client for Windows. The program and its source code are both available at Adam Haile's website. Elpis requires the Microsoft .Net Framework 4.0 to be installed on the system. It is compatible with both 32-bit and 64-bit editions of the Microsoft Windows operating system. OpenPandora (http://getopenpandora.appspot.com/) has been around for years and does the exact same thing. That said, I’m not sure if it still works — recent changes to the site may have broken it. It requires the .NET Framework too. Also, Pandora One customers have access to the Pandora Desktop App (http://help.pandora.com/customer/portal/articles/90988-desktop-app), which is an Adobe AIR app. Does what the others mentioned do, and ALSO includes automatic (optional) setup of TorTunnel for those of us who want to enjoy Pandora but work for The Man behind restrictive firewalls. Unfortunately, OpenPandora hasn’t worked since Pandora switch to HTML5 only. @Martin – When Pandora first launched they did, in fact, allow access from outside of the U.S., unfortunately the licensing became too great so they refocused their efforts on U.S. only. Judging by your website TLD, I’m guessing that your old account was setup back during that time when they allowed non-US accounts. Unfortunately, as of this initial release, I do not support proxies in Elpis. Since it was a US only service to begin with, I wanted to judge the desire for that feature before I worked on it. Adam, I have tested it with a vpn, so no problem here on my side accessing Pandora with your app. Nice. Glad you could get to it after all. Enjoy! Ha… I just looked at the first name, thought it was the same Martin. But still, glad it works via the VPN.